Img: Shorpy/Lewis Wickes Hines. 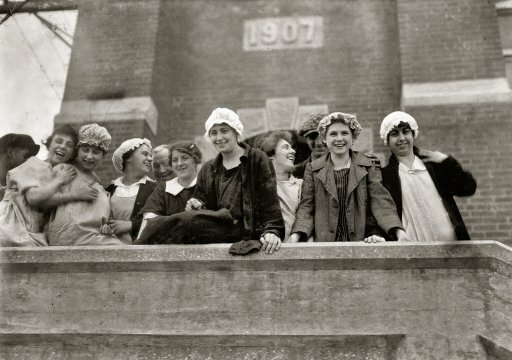 Thread mill girls in Fall River in 1916. What’s interesting is to look at numbers from the US Census board that, in 1910, put Chicago’s foreign-born population at 35.9 percent of the city, up just over a percent from 1900. In Boston, that same figure is 36.3% percent. So here’s the puzzle: what is Mayor Fitgerald, “known as a deep student of immigration questions” talking about? Here’s perhaps one catch, Chicago’s total population in 1910 is just over two million persons while Boston is at a little over half a million–the entire city just a little more than the size of Chicago’s immigrant population. The rest of the answer probably has something to do with shifting industrial patterns already at work at the turn of the twentieth century. Boston and the rest of England actually had a lead on Midwestern cities of several decades in industrial production. While not New York or Philadelphia, Boston and surrounding towns hosted some of the largest concentrations of immigrants working in industrial manufactures. These were typically industrial manufactures of light consumer goods. Like chess shops or diamond merchants in New York, industry of the same type tended to cluster–to draw on concentrations and exchanges of expertise, and particularly in the case of advanced mechanical operations, skilled technicians and experienced workers. In 1880, 57% of the country’s printed cotton cloth produced came from in southeastern New England textile centers, more than half from the textile mills of Fall River (Fall River’s foreign born workforce in the 1870s was 51%). The East’s lead in these inexpensive products contributed to the decision of Midwestern industry to focus on more expensive commodities, leaving the established consumables market to cities like Boston and focusing on heavy regional products like building materials. With better transportation networks, the advantage of cities with wide regional access grew and specialization became established as goods could be transported anywhere. By the beginning of the twentieth century, that lead also had become a liability. The age of Boston’s factories was beginning to show and stiff competition in textiles, at least, emerged from the South. The area began to see its manufactures decline for the first time. This entry was posted in Old News and tagged Chicago, Fall River, Immigration, Industry, Mayor Fitzgerald, Textile Mills. Bookmark the permalink.